Moronic, imbecilic, stupid, petty, ignoramus: there are just so many different ways to describe Maggie Sottero and its management without becoming insulting. That is pretty much the case when it comes to bridal gowns as far as describing them. How many different ways are there to clinically describe something? Few. Yet the morons at Maggie Sottero Designs feel they have a copyright on every description of their gowns so if you want to resell them you must find another way to let your prospective purchaser know about your product. Maybe tell them to visit a psychic? Not to be confused with the psycho at Maggie Sottero. Some pea-brained moron named Jennifer D'Arc, the Manager of Compliance at Maggie Sottero Designs, recently told a seller that her listings were "removed due to the listing using copyrighted text owned and registered with the U.S. Copyright Office by Maggie Sottero Designs, LLC" and that "the listings used copyrighted gown descriptions which we have not given you or your company permission to use". Tell us Jennifer D'Arc, the Manager of Compliance at Maggie Sottero Designs, what is in that Utah water you have been drinking? Or are you as stupid as we think you are? One-piece, strapless or short sleeve, A-line gown with sweetheart neckline and corset back. The bodice is adorned with lace applique that are echoed in the front insert panel and back train. The basque waistline falls into a center front cutaway panel and back train. Available with short sleeves. We have highlighted the passages that are similar with more than two consecutive words. Neither description is worthy of copyright protection. Is the auction description similar? Yes. Was it copied? No. The test for "copying" under copyright law is that the items must be "substantially similar". There are more differences than there are similarities. Besides, product descriptions do not qualify for copyright registration when they are strictly informative or relating to the characteristics of the products. Product descriptions generally are a series of brief phrases about the product and, as such, lack the minimal originality required to be copyrightable. But that doesn't stop Maggie Sottero Designs from assuming that they are special and that federal laws do not apply to them. "Short phrases" are excluded from copyright as a matter of law. 37 C.F.R. § 202.1(a); CMM Cable Rep., Inc. v. Ocean Coast Props., Inc., 97 F.3d 1504, 1520 n.21 (1st Cir. 1996) (collecting authority). What is "short" depends somewhat on context -- even paragraphs of news or similar fact-intensive writing are excluded. Nihon Keizai Shimbum, Inc. v. Comline Bus. Data, Inc., 166 F.3d 65, 71 (2d Cir. 1999) (news paragraph not protectable); Alberto-Culver Co. v. Andrea Dumon, Inc., 466 F.2d 705, 710 (7th Cir. 1972) (paragraph describing product not protectable). In Lexmark Int'l, Inc. v. Static Control Components, Inc., 387 F.3d 522, 535 (6th Cir. 2004), the court stated, "Phrases that are standard, stock" or "dictated by practical realities" or "tradition and settled expectation" are not protected. And who really wants a gown by Maggie Sottero Designs, anyway? The tag shown says that this pricey dress is 100% polyester with a bit of nylon. And it was lovingly crafted by sweatshop workers in the wonderful Peoples Republic Of China. What? Weren't there any sweat shops in New York or Los Angeles to do the work instead of out-sourcing the work to China? At least keep the slave wages in the US and help the economy. Mothers, do not let your daughters walk down that aisle on that very important day wearing POLYESTER! How gauche! Even Martha would not condone that, would she? And consider the obscene profit on a schlock dress like this. Total cost to Maggie Sottero Designs must be less than $25 and these things sell for over $700? For polyester? Made in China? Oy vey. Maggie Sottero Designs does have a recent copyright on a publication titled Spring 2009 Sottero & Midgley Price & Style Director. Even if the descriptions were taken from this publication, and they were not, the publication as a whole is copyrighted, not the individual descriptions. This is another example of snot-nosed managers trying to elevate themselves to playground bully because they believe they have a legal club to use on the unsuspecting. 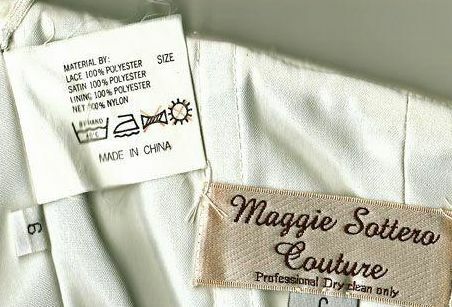 Companies like Maggie Sottero Designs, and their managers, should be held liable for punitive damages for taking such illegal actions as these. No court would hold these gown descriptions as having copyright protection.